In creative writing courses, authors who are neophytes are customarily taught by authors who are published and therefore literally authorised. The word ‘author’ stems from the Latin root ‘auctor’, meaning ‘producer, promoter, progenitor’ (usually with a strong masculine connotation of paternity). So it is no surprise that a kind of atavism tends to hum in the loop where aspiring authors get taught by inspiring authors. A myth pervades and persuades inside the loop: to be an author is to be a special, fecund self. It’s a natural fact, isn’t it? Accordingly, although it may not take an author to know an author, it must take one to teach one. Specialness whelps specialness. This is ancient common sense, surely? This is lore, surely? 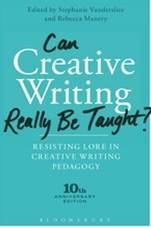 But here is a question worth asking: can creative writing be taught well by a non-author? For example by a rhetorician? Or by a critical reader? By an erudite one? By a linguist? A technician? An inventor? A painter? A chef? A mechanic? Asking these questions one wonders about the notion of ‘authorial lore’, the notion central to the highly esteemed anthology Can Creative Writing Really Be Taught?, both the 2007 original edition and this, the new 2017 expanded reprisal. One wonders whether the business of synthesising, generating and communicating knowledge about creative writing really has to be a guild or cult activity. Maybe the teaching of creative writing is as much a technical set of tasks as it is a drama of personal assertion. Maybe authorship is not as atavistic as it is assumed in some cultures to be. With authorship, maybe it does NOT take one to teach one. The key phrase in the sub-title of Can Creative Writing Really Be Taught? – ‘lore in creative writing pedagogy’ – refers to a belief that the teaching of creative writing is mainly the espousal of innate secrets of self-expression divulged by blessed guild-insiders. Such lore contends that published authors carry a lode of tacit know-how which is a kind of personal specialness and that the only way of transferring this know-how to acolytes is to put the aspirants in the presence of the senior fecund self so as to afford some osmotic effulgence. A full self irradiates an inchoate self. For shorthand in this review, let’s call this belief-salad ‘the lore’. In a North American culture where, by all reports, belief in authorial effulgence has long prevailed, it would be a laudable enterprise to teach in ways that resist the unreflective charismatics and dime-store mysticism of ‘the lore’ and to thereby de-stabilise the hagiographies that at best befuddle and at worst bully novice writers. Such is the laudable mission of Can Creative Writing Really Be Taught? It imagines an American pedagogical scene in which a student could learn technically to become a writer, rather than simply learn whether he or she already inherently is one, having been ratified by a real one. In the paragraph above, I have oversimplified, perhaps. But I think it is worth saying the next thing simply too: all this worry about ‘the lore’ in creative-writing pedagogy is an inherently American concern. Written by US authors (with one notable exception, who will be glossed and appreciated momentarily) for an assumed-universal US reader, Can Creative Writing Really Be Taught? accepts that ‘the lore’ is the norm and that it really matters. And on that basis, the majority of the essays do excellent and necessary work dismantling the old common sense that seems to have rendered normal (until recently) for bloviated personal revelation to be a principle modus operandi of creative-writing teaching in the US. To the extent that all kinds of US lore still soak the globe, it is plainly important to critique and re-jig common-sense assumptions impelling the individualist manias that American cultural imperialism has exported fervidly since the Gilded Age. Even so, I feel duty-bound to note that the lore at the core of Can Creative Writing Really Be Taught? is not really normal or common in many other cultures where creative writing is taught. For example, in my own culture, Australia, the assertion of individualist ambition or sovereignty is normally mis-trusted and tall-poppied, with the effect that the charismatic secret-specialised self is not much discussed in creative-writing pedagogy. In other words, a large number of teachers and students are subject to laws and lores that differ from US normality. Therefore in many classrooms and online chat-rooms outside the US, questions about special personhood or wisdom or charisma (which of course are part of but not most of becoming and being a writer) receive only passing attention compared to technical exercises in language, rhetoric, ethics and politics. This proportionate disregard of ‘the lore’ is the norm for teachers and students in the UK, Australia, New Zealand, Hong Kong, South Africa, Singapore and Canada too, to name just some of the Anglophone pedagogical domains. To be fair and laudatory,within its parochial worldview Can Creative Writing Really Be Taught? performs crucial political and intellectual work that is instructive everywhere. For example, the book works hard to splinter ‘the lore’ from inside by shivering it with several of the sub-divisions in US identity-politics, properly taking account of race, ethnicity, gender, sexuality, disability-activism and class-affiliation, all of which divert power from the male-heroic charismatics and the passive-aggressive ‘neutral-facilitator’ roles that seem, until recently, to have been the twinned unreflective forces in American creative-writing courses. In highlighting the alternatives and showing how sub-divisional identity politics offer ways to de-familiarise some of the norms of individualist creative-writing teaching modes, the book agitates for change both in pedagogy specifically and in American identity-politics more generally. All this is laudable and timely, especially within parochial American contexts. As a bonus, splintering ‘the lore’ also piques one’s appetite for other kinds of books. For example, it shows how many of us are craving publications and publishers that are aware of the many different national perspectives (in addition to the sub-divisions within individualistic, person-centered identity-politics in the US) that can be applied to creativity, individuality, communality, ingenuity and the communicability of knowledge. One senses one’s appetite piqued for worldviews where neophytes are not naturally destined and desiring to become some type of special Americans. Ross Gibson is Centenary Professor in Creative & Cultural Research at the University of Canberra.